The US Dept. of Commerce’s final determination on Canadian newsprint tariffs—proceeding but at a reduced rate—generated a plethora of responses, most negative. In other news: RISI acquires Random Lengths; market pulp reaches record prices in 2018; Northern Energy reveals their pellet plant plans; and Western Forest Products, Interfor and Rayonier’s positive Q2 results are in. Finally, the first ever UK-made CLT is making its building-debut and Fortress Paper is adding value to its pulp-making business with sweeteners for chewing gum. Monday, August 6th is a holiday in British Columbia, as such the next edition of the news will be Tuesday, August 7th. Thank you. 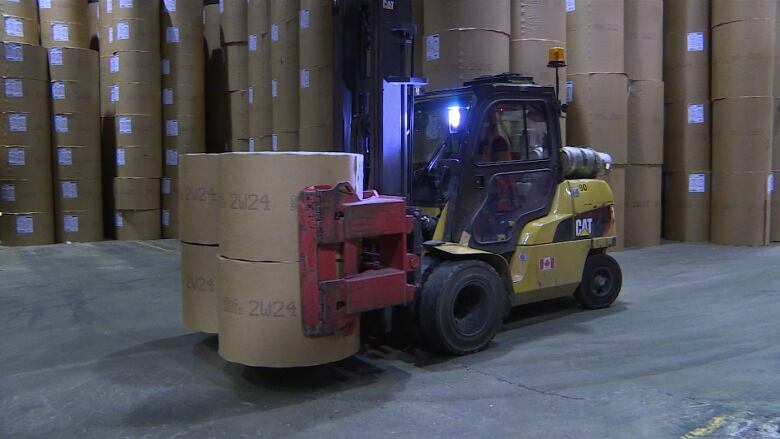 North America’s largest newsprint producer hopes rare bipartisan political support in the United States will convince the U.S. International Trade Commission to overturn final import duties announced Thursday. 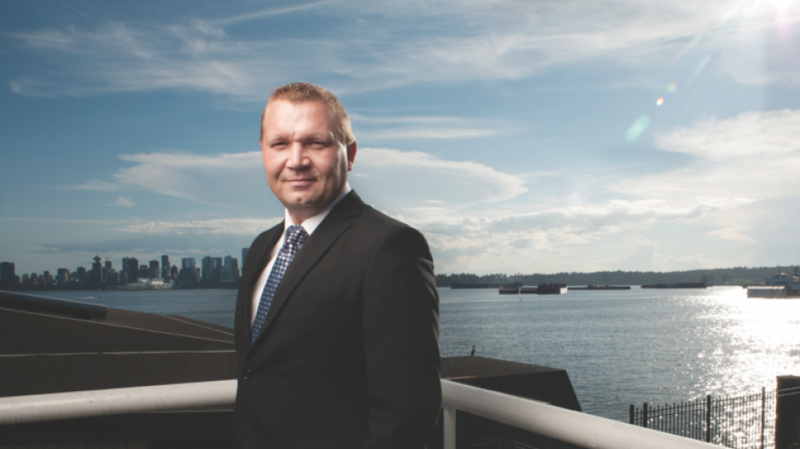 The United States government gave most Canadian newsprint producers a reprieve by lowering final anti-dumping and countervailing duties… …Resolute Forest Products CEO Yves Laflamme said he hopes the commission will reject the Commerce Department’s determination, just as it did in January when the panel sided with Bombardier against U.S. aerospace giant Boeing… “It’s not about helping the Canadian industry, it’s about saving the newspaper industry,” he said, noting that the duties are passed along to publishers through higher prices. “It’s just going to kill that business faster than it is right now.” Foreign Affairs Minister Chrystia Freeland said tariffs on Canadian newsprint will continue to inflict pain on the U.S. publishing industry and could cost job losses at local newspapers and publications. Richmond, BC – Catalyst Paper responded with disappointment today following the U.S. Department of Commerce’s final determination setting Catalyst’s countervailing duty rate at 3.38% and anti-dumping duty rate at 16.88% on Canadian exports of uncoated groundwood paper. …“While not surprised, we’re disappointed” says Ned Dwyer, President and Chief Executive Officer. “These duties are punitive and without merit.” …Following today’s decision, the U.S. International Trade Commission will consider whether imports from Canada have injured the U.S. industry, as was alleged in the petition by only one mill—North Pacific Paper Company. If the ITC reaches an affirmative determination at the end of August, the DOC is expected to issue a final order on the case in mid-September. WASHINGTON — The Commerce Department said on Thursday that it would proceed with tariffs on Canadian newsprint, a blow to an already-struggling American newspaper industry. The tariffs are somewhat lower than what the department initially imposed, offering publishers a small reprieve. The agency said it would cap the tariffs at 16.88 percent, down from 22 percent, and apply them to just one Canadian manufacturer, Catalyst Paper Company. But the Commerce Department said it would also impose tariffs of up to 9.81 percent on several Canadian paper companies to counter subsidies that those manufacturers receive from the government. While the tariffs are not as severe as many in the industry had feared, much of the damage has already been done. …Industry executives said that the lower tariffs would ease the pain somewhat but that it was still a huge burden on an industry that cannot afford higher costs. Combined duties slapped on Catalyst Paper Corporation’s exports of groundwood paper by United States Department of Commerce total 20.26 per cent. The department made the announcement on Thursday, August 2. 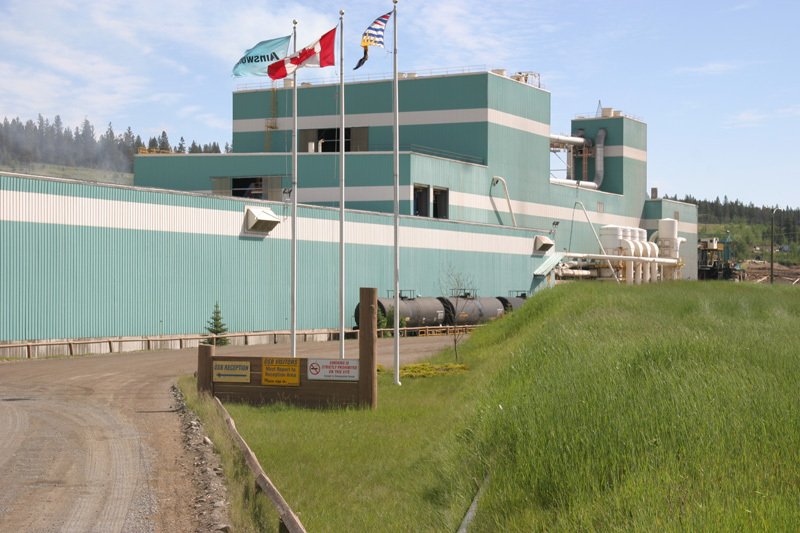 Groundwood paper accounts for approximately 60 per cent of production at Catalyst’s Powell River mill. In a statement, Catalyst called the announcement disappointing and the tariffs significant. “While not surprised, we’re disappointed with the US Department of Commerce’s decision to keep these unwarranted duties in place, albeit at a lower rate,” said Catalyst president and chief executive officer Ned Dwyer in the statement. … “While our mills have provided newsprint to the US for more than 100 years, we’re now changing our customer base to minimize the impact of these duties because of one US mill, but this isn’t sustainable over the long term,” said Dwyer. The U.S. Department of Commerce has eased up on planned tariffs on Canadian newsprint, reducing the total duties on Corner Brook Pulp and Paper from about 32 per cent to just under 10 per cent. …On Thursday, though, the Department of Commerce revised the numbers downward as a result of its investigations into imports of uncoated groundwood paper from Canada. The anti-dumping duty was revised to zero per cent for all but one Canada producer, and Kruger’s export duty was lowered slightly, from 9.93 to 9.53 per cent.”We were pleased with the decision,” Premier Dwight Ball told CBC on Thursday. …Ball said Corner Brook Pulp and Paper’s owner, Montreal-based Kruger, is in a much more competitive position than it was before the U.S. lowered the duties. The price of newsprint has jumped to its highest level in a decade as tariffs imposed by the Trump administration on imports from Canada start to bite, causing US newspapers to further pare down print offerings and piling more pressure on the beleaguered industry. 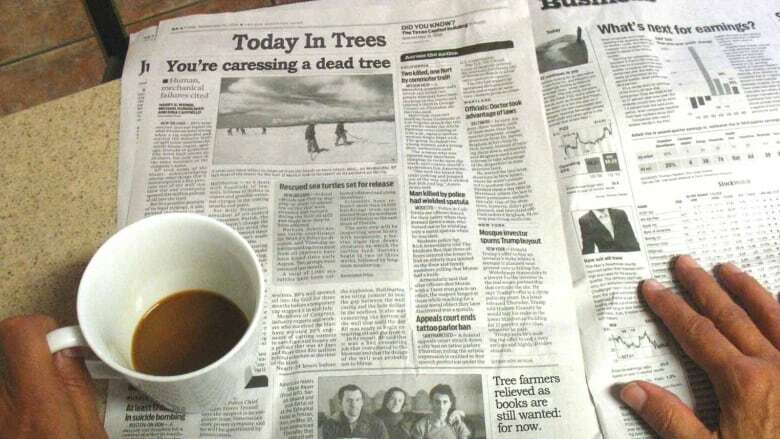 Prices of the paper have risen almost one-fifth in the past year, according to the Foex US 30lb newsprint index, to $647 a tonne. Printers and publishers blame the price jump on tariffs… “These tariffs definitely shock the marketplace in a way that regular supply and demand economics would not do,” said Pat Henderson, director of government affairs at Quad/Graphics. Rising newsprint prices were cited by the Tampa Bay Times when it announced job cuts earlier this year. The publishers of the Pittsburgh Post-Gazette have told its union that the paper will cease printing two days a week from next month. WASHINGTON — The U.S. Commerce Department is going ahead with a tax on Canadian newsprint, a threat to the already-struggling American newspaper industry. The revised tariffs unveiled Thursday are mostly lower than those originally imposed earlier this year. But they would still hit the paper used by newspapers and other publications with an anti-dumping border tax as high as 16.88 per cent. The tariffs are a response to a complaint from a hedge fund-owned paper producer in Washington state…. In addition to antidumping duties, Commerce is imposing newsprint levies ranging from 0.82 per cent to 9.81 per cent to counter Canadian subsidies. The Commerce decision is not final. The independent U.S. International Trade Commission could change or kill the tariffs in a ruling scheduled for next month. …Chrystia Freeland, Canada’s minister of foreign affairs, said that despite the slight reduction in some duties, “Canada remains disappointed with the final duty rates” announced by the Commerce Department. 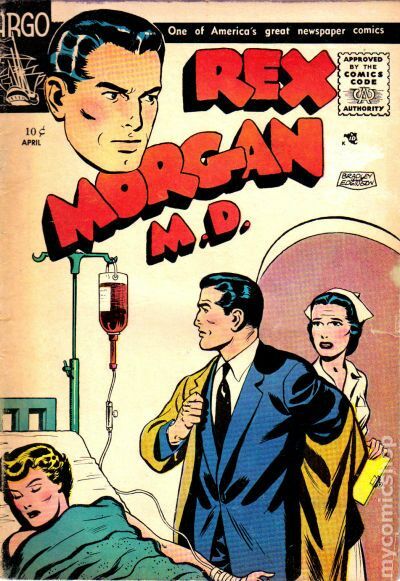 RALEIGH, NC –Residents in a North Carolina town hoping to read “Rex Morgan M.D.” with Sunday coffee are in for a rude awakening. And a newspaper says it’s all President Donald Trump’s fault. The Robesonian in Lumberton announced it’s dropping an eight-page color comics section from Sunday editions. A newspaper editorial last week said it made the “not-so-funny” decision to cut the comics because of rising costs spurred by Trump administration tariffs on Canadian newsprint. …Douglas said the newspaper decided it was better to cut the comics than risk reducing staff or freelancers who cover local news and serve as watchdogs for local government. The newspaper with a Sunday circulation of 6,200 is based in the town of about 21,000 people approximately 100 miles (160 kilometers) south of Raleigh. Washington, D.C. – Stop Tariffs on Printers & Publishers (STOPP), a coalition of printers, publishers, retailers, paper suppliers and distributors today released the following statements regarding the U.S. Department of Commerce’s final determination on uncoated groundwood paper imports from Canada. “These import duties on newsprint have already caused job losses in the printing and publishing sectors and have resulted in decreased news coverage in local communities,” said David Chavern, president and CEO, News Media Alliance. “Although this is a step in the right direction, the reduced rates only lessen the pace at which the tariffs are harming the industry. We hope that the International Trade Commission will entirely reverse these misguided tariffs at the end of the month.” …This claim was filed by North Pacific Paper Company (NORPAC), a single paper mill located in Longview, Washington, owned by a New York private equity firm. Firefighters from 100 Mile Fire Rescue and the 108 Mile Ranch Volunteer Fire Department pulled an all-nighter on July 29. “On July 28 100 Mile Fire Rescue responded to a fire at the [Norbord] OSB Plant,” said Fire Chief Roger Hollander. “We arrived to a fire that was outside the plant and the OSB was on fire approximately 50 by 80 in size.” Norbord staff were initially trying to control the fire with hose lines from the mill before the 100 Mile Fire Rescue took over the scene. The 100 Mile department ended up calling the 108 Mile VFD for assistance with water and manpower. …“It was a fairly difficult fire in that was a large size and it was hard to fully extinguish because we needed to pull the piles apart and as you could imagine, there’s a lot of fuel load as we call it, all condensed into one area,” said Hollander. VANCOUVER, B.C., — INTERFOR CORPORATION recorded net earnings in Q2’18 of $63.8 million, or $0.91 per share, compared to $33.0 million, or $0.47 per share in Q1’18 and $24.5 million, or $0.35 per share in Q2’17. Adjusted net earnings in Q2’18 were $68.9 million or $0.98 per share, compared to $36.8 million, or $0.52 per share in Q1’18 and $28.7 million, or $0.41 per share in Q2’17. Adjusted EBITDA was a record $123.8 million on sales of $619.9 million in Q2’18 versus $81.1 million on sales of $527.6 million in Q1’18. VANCOUVER, British Columbia, — Western Forest Products Inc. reported adjusted EBITDA of $50.2 million in the second quarter of 2018, compared to adjusted EBITDA of $47.1 million in the second quarter of 2017, and $43.0 million reported in the first quarter of 2018. Operating income prior to restructuring and other income was $39.7 million in the second quarter of 2018, compared to $37.7 million in second quarter of 2017, and $32.6 million reported in the first quarter of 2018. Increased lumber shipments and lower manufacturing costs in the second quarter of 2018 more than offset the impacts of $11.7 million of US export lumber duty expense and significantly higher stumpage costs. By Rayonier Advanced Materials Inc.
JACKSONVILLE, Fla.—Rayonier Advanced Materials Inc. today reported second quarter 2018 net income of $54 million, or $0.83 per diluted common share compared to $5 million, or $0.03 per diluted common share in the second quarter of 2017. Second quarter 2018 adjusted net income was $39 million, or $0.60 per diluted common share, compared to $9 million, or $0.11 per diluted common share in the second quarter of 2017. Second quarter 2018 adjusted net income and diluted earnings per share are adjusted for a gain on bargain purchase associated with the acquisition of Tembec Inc. Adjusted net income and diluted earnings per common share amounts for second quarter 2017 are adjusted for transaction costs and an unrealized gain on a derivative instrument both associated with the acquisition of Tembec. THOMASTON, Georgia – Interfor Corporation is investing into its Thomaston Sawmill in Upson County. The lumber manufacturers announced its Thomaston mill will be part of Phase II of the Southern Investment Strategy. In all, Intefor Corporation is taking on major modernization and rebuilds at five sawmills in the South. The company is taking on an effort to increase efficiency and boost production. The total combined cost of Phases I and II is expected to be $305 million. And the projects are designed to increase production capacity by approximately 425 million board feet per year. “Forestry has always been a key economic driver in Georgia, and Interfor’s commitment to our state is significant,” said Georgia Governor Nathan Deal. BOSTON — RISI, Inc., a leading information provider for the global forest products industry, announced today that its parent company, Euromoney Institutional Investor PLC, has acquired Random Lengths, a leading price reporting agency for the wood products industry. Founded in 1944, Random Lengths provides unbiased and consistent price assessments and market reporting for the global wood products industry, with a core focus on the North American lumber and panels markets, publishing over 1,500 prices each week. Random Lengths will compliment and expand RISI’s existing wood products price reporting. “Random Lengths is a leading source for prices in the lumber and panel markets, with a rich history of delivering trusted, unbiased insights,” said Daniel Klein, CEO of RISI. SEATTLE — Strong pulp markets and record high prices for both softwood and hardwood market pulp resulted in upward price pressures on wood fiber throughout the world in the 1Q/18, reports the Wood Resource Quarterly (WRQ). The Global Softwood Fiber Price Index (SFPI)was up by 3.4% from the 4Q/17 to the 1Q/18, the second highest quarter-to-quarter increase in seven years. Softwood prices rose in all 20 regions covered by the WRQ with the exception of Eastern Canada, where chip prices fell 16% q-o-q (in US dollars). Hardwood pulplogs saw a more modest price increase than softwood pulplogs, with prices rising the most in Russia, Spain and Finland. The Global Hardwood Fiber Price Index (HFPI) reached a three-year high in the 1Q/18 and was 8.0% higher than in the 1Q/17. A couple of years from now, when you pop a piece of Dentyne or Trident chewing gum in your mouth, you may well be tasting a sweetener made from wood and agricultural byproducts using a technology developed by North Vancouver’s S2G Biochemicals Inc. Perhaps the best endorsement of the technology is that Vancouver-based Fortress Global Enterprises Inc. recently bought up eight-year-old S2G in a $2.5 million deal. Initially, S2G was focused primarily on refining bio-glycols – an alternative to the glycols derived from oil and gas – but it has now entered what could be an even more valuable market: making sweeteners for chewing gum. According to Mark Kirby, CEO of S2G, which is now a fully owned subsidiary of the Fortress Advanced Bioproducts division, Fortress is developing a whole new strategy in wood processing. “Fortress wants to turn pulp mills into biorefineries,” he says. 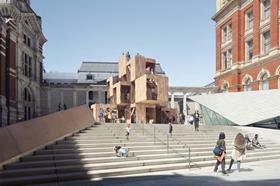 The first ever UK manufactured cross-laminated timber is set to be at Waugh Thistleton’s V&A pavilion. The product, which is being produced by the Construction Scotland Innovation Centre near Glasgow, will be used in a 9m tall pavilion (pictured) the architect is designing for the V&A’s new Sackler courtyard beside Exhibition Road as part of next month’s London Design Festival. Most of the CLT products used in the UK are currently trucked in from Austria. When it landed the V&A job in May, Waugh Thistleton, which specialises in CLT buildings, said the project would arrive on site like a piece of flat-pack furniture and be built in less than a week. Earlier this summer, Waugh Thistleton co-founder Anthony Thistleton warned the government’s proposed ban on combustible cladding materials could spell the end of the construction method. The Lower North Thompson Community Forest Society (LNTCFS) recently held a number of accountability meetings and open houses with a meal included in the communities of McLure, Squam Bay, Barriere, Chu Chua and Little Fort. 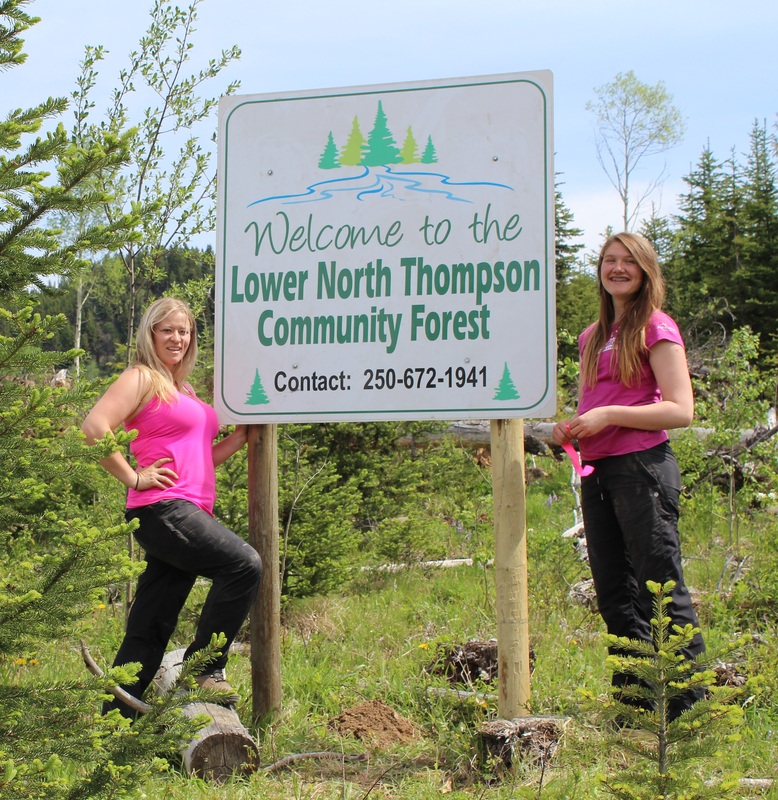 Residents in the areas were encouraged by the LNTCFS to, “Learn about your community forest, and share your ideas about the Lower North Thompson’s future”. “LNTCFS Manager Mike Francis, RPF, and Chairman Harley Wright, assisted by other employees, provided an interesting update on the LNTCFS’s activities over the last two years. The 8,254 ha community forest runs from just west of East Barriere Lake between the Barriere River and the Dixon Lakes. The Society generated $2.67 million in sales in 2016/17 fiscal with a total volume of 26,957m3 of wood. Nanaimo – Trans Canada Trail (TCT) is delighted to announce a $200,000 gift from TimberWest Forest Corp., which will support new improvements along The Great Trail in British Columbia. TimberWest first gave $100,000 in 2017, which helped connect a significant portion of The Great Trail on South Vancouver Island. Now, today’s generous donation will support two further Trail enhancement projects along the Cowichan Valley Trail, from Halalt First Nation to the town of Ladysmith, in partnership with the Cowichan Valley Regional District. The Trail in B.C. currently stretches over 3,000 kilometres, profiling the province’s stunning landscapes and coastal areas. Now, TCT and its partners are focused on enhancing and nurturing Trail sections across Canada for future generations. Vancouver, BC – TimberWest is once again a classroom to a group of excited summer students, eager to further their knowledge of the forest industry. A select group of students are receiving a hands-on experience in silviculture, forest engineering, and forest biology while assisting the company’s operations in Nanaimo and Campbell River locations. Benefitting from an exchange of knowledge and invaluable professional experience, students’ responsibilities are as varied as B.C.’s coastal biodiversity. From workshops in climate change to overseeing drone flights and monitoring artificial bear dens, TimberWest encourages participation in a variety of tasks. Students learn about the environmental conditions of various plant species- why some thrive while others require maintenance, given ecological constraints. For Douglas-fir trees, 2017 was a rough year in the Cariboo. Not only did wildfires scorch hundreds of thousands of hectares, many of which contained Douglas-fir trees, a windstorm on May 23, 2017 knocked over trees throughout the area. Meanwhile, something less immediately noticeable has been pestering Douglas-fir trees specifically. … For multiple consecutive years, the area affected by Douglas-fir beetle has been on the rise, with the affected hectares in the Cariboo growing from 2,659 hectares in 2013 to 69,418 hectares in 2016. There was a slight decrease in 2017, to 65,446 hectares. “It can be assumed that the total area of mapped infestation would have been higher were it not for the Elephant Hill and Alexis Creek/Hanceville fires, which consumed large areas of infested Douglas-fir forest and/or masked evidence of Douglas-fir beetle attack,” according to the FLNR’s 2017 Overview of Forest Health Conditions in Southern British Columbia report. According to Regional Entomologist Jeanne Robert, Spruce beetle is a native species and normally just a part of a healthy ecosystem. But a changing climate and the lack of extremely cold winters are causing an exponential growth in the spruce beetle population. …In 2014, at the beginning of the outbreak, the spruce beetles affected an area of about 8,000 hectares. Four years later that area is 372,000 hectares and is still growing. Keeping track of the scope of the infestation is difficult. “We’re kind of a year behind,” said Robert. “The trees stay green for well over a year before we can see from the air that the tree is dead.” For woodlot owners and people with acreages or even a few big fir trees in the yard, Robert said there is a way to fend off spruce beetle. 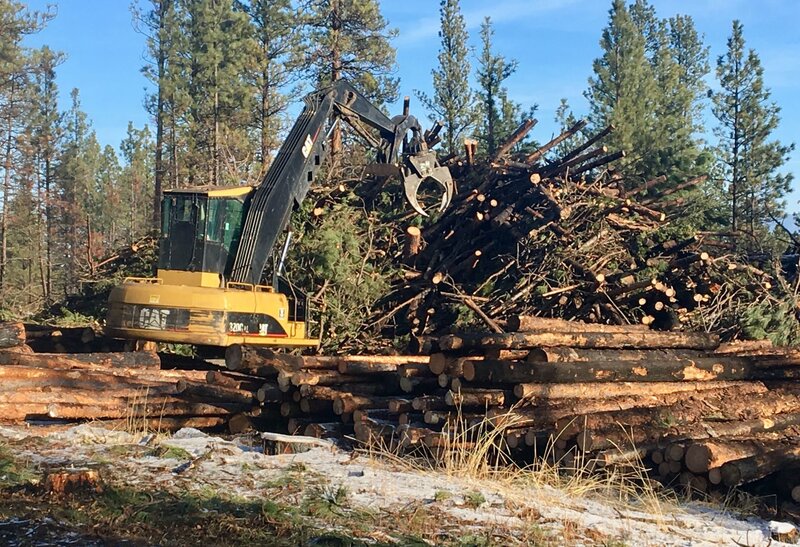 The U.S. Forest Service will proceed with an Elliston-area timber and fuels reduction project after a U.S. District Court judge dismissed a lawsuit filed by two environmental groups – a decision the groups say they will appeal.The 5,700-acre Telegraph Vegetation Project includes logging and prescribed burning about 15 miles southwest of Helena and 5 miles south of Elliston. Approved last year, the project seeks greater resiliency to wildfire, insects and drought through diversifying age classes of trees along with producing 25 million board feet of commercial timber.Last spring, Three Forks-based Native Ecosystems Council and Helena-based Alliance for the Wild Rockies filed a lawsuit in federal court challenging the project on multiple fronts. The groups contended that the project violated environmental laws while degrading fish and wildlife habitat including impacts to elk, Canada lynx and grizzly bears. BOISE, Idaho — The federal government has put on hold one of the largest-ever projects to remove juniper trees in an effort to help an imperiled species after an appeal by an environmental group seeking to halt the plan. A U.S. Department of the Interior administrative panel on Wednesday granted the U.S. Bureau of Land Management’s motion to set aside its decision in May to remove juniper trees from about 1,100 square miles (2,800 square kilometers) in Idaho’s Owyhee County. Federal officials say the project will protect habitat for imperiled sage grouse and benefit cattle ranchers. Alaska and the U.S. government are seeking new regulations that could open more of the state’s forests to roads and development to drive its economy, the U.S. National Forest Service said on Thursday. President Donald Trump has vowed to open greater sections of public land to energy and industry. Environmentalists have said that roads in certain areas could harm Alaska’s salmon industry by eroding protection of old-growth forests and rivers and streams where the fish breed. 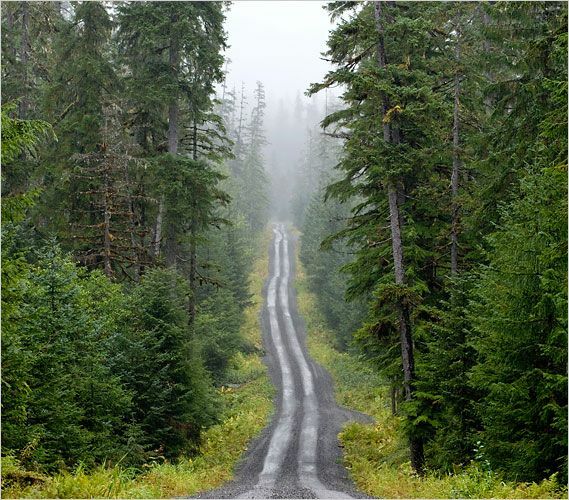 Currently in Alaska, 93 percent of National Forest System lands are designated roadless areas or wilderness where roads cannot be built, according to the U.S. Forest Service. The talks followed a request by Republican U.S. Senator Lisa Murkowski for Alaska to be exempted from a 2001 national statute outlawing road construction in certain types of forests. More than three dozen people gathered outside the offices of the Humboldt Redwood Company office in Scotia on Thursday to protest proposed logging in the Mattole River watershed. The protest comes on the heels of a confrontation between protestors and Humboldt Redwood Company personnel on a logging road west of Redcrest last week. Security officers hired by the company confronted and detained three protestors who were later arrested by sheriff’s deputies. The protestors, associated with the environmental activist organization Forest Defenders, aimed to prevent logging crews from accessing some 1,100 acres of forest. “I think there is a disagreement between what the entities identify as old growth,” said Amber Jamieson, a 10-year conservation advocate with the Environmental Protection Information Center. …The blockades have been in place for about a year and protestors argue that direct action is necessary to protect the forest. PORTLAND — Conservation groups sued the Oregon Department of Fish and Wildlife Commission on Thursday for failing to strengthen protections for the marbled murrelet, tiny seabirds that venture inland to raise their young and depend on old-growth forests for nesting.The groups petitioned the commission in 2016 to reclassify the bird’s status from threatened to endangered under the state Endangered Species Act. A listing as endangered would require the state to develop a management plan and survival guidelines for the birds that are about 9 inches long and weigh 7 to 8 ounces. The commission denied the petition in June by a 4-2 vote, after hearing testimony from officials in timber-rich coastal counties who worried about the economic impact of restricting logging to save the birds. Commissioners opposed to reclassification said researchers from Oregon State University are in the early stages of a 10-year study about the seabird, and they wanted to wait for results. The Carr Fire doubled in size twice in just several days. What kind of conditions can make this happen? There are lots of drivers. Fuels like timber and grass, drought to dry them to the point of combustion, and high temperatures that help flames spread quickly are usually involved. The Tubbs Fire, which burned into Santa Rosa in 2017, was counterintuitively set up by a break in California’s drought during the previous winter. 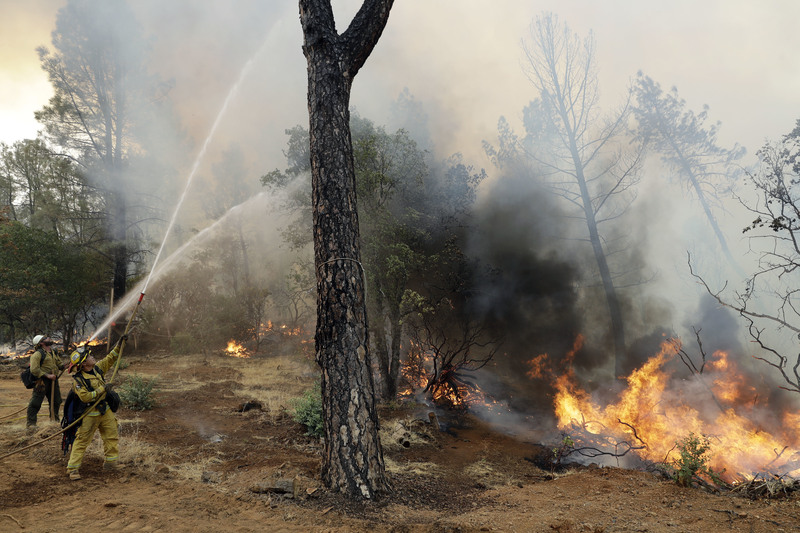 That pulse of moisture allowed a burst of what firefighters call “one-hour fuels” — grasses and other fine vegetation that grow fast, but can be dried to the point of burning in an hour when drought conditions return. California’s drought has also killed more than 100 million trees, which can stoke more intense fire behavior. Wildfire crews and the Keremeos Fire Department have been called to the end of Beecroft River Road in Cawston where a one-hectare fire is burning after the Snowy Mountain wildfire reportedly jumped over the Similkameen River at 10 p.m. “Due to strong winds coming downslope tonight up to 50 km/h, fire activity continues to be highly vigorous,” a post on the BC Wildfire Service website said. “The fire has spotted across the Similkameen River to the east side in an oxbow along the riverbank.” “Crews are responding to right now in conjunction with the Keremeos Fire Department and heavy equipment is en route.” There is no word on evacuations from the Regional District of Okanagan-Similkameen at this time. Think twice before bypassing campfire bans, flying drones or recreational boats near wildfires this weekend as firefighters work on the frontlines of more than 300 blazes burning across B.C. That’s the message from the province to campers and outdoor enthusiasts, who are being asked to avoid the top three most common issues that either cause fires or prevent the experts from fighting them. “The men and women of the BC Wildfire Service are working long hours in sometimes very difficult conditions, so I’m asking everyone to do their part to prevent wildfires and not add to their workload,” Forestry Minister Doug Donaldson said. So far this year, BC Wildfire Service personnel have responded to 1,260 wildfires. About 340 of those, or 27 per cent, were caused by people. 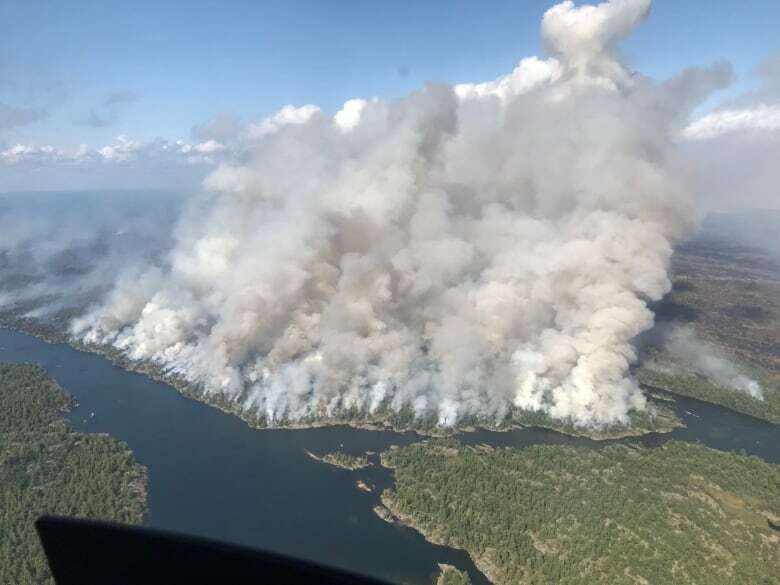 Cloud cover and high humidity continued to aid firefighters working to get the enormous Parry Sound 33 forest fire under control on Wednesday. The fire, which has now officially been burning for more than two weeks, is covering 11,185 hectares in the province’s northeastern region and is still considered “not under control.” According to an update provided by the Ministry of Natural Resources and Forestry (MNRF) on Aug. 1, Parry Sound 33 was one of 49 active forest fires in the northeast. Of those fires, 21 were considered “not yet under control,” while the other 28 were either “being held,” “under control” or “being observed.” The ministry says Parry Sound 33 is still approximately five kilometres west of Highway 69, and less than one kilometre south of the Pickerel River near the CN trestle bridge on the west side of the highway. The National Weather Service says fire-weather conditions now exist across much of Montana, with high temperatures, low humidity and strong wind gusts forecast through tomorrow. 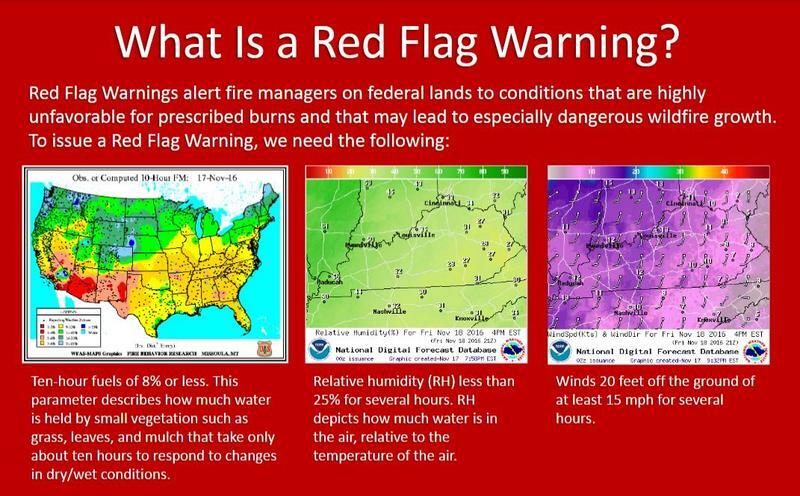 Red flag warnings are in effect. Meteorologist Luke Robinson in Missoula says the so-called red flag warnings help local fire officials, “When we expect really hot and dry conditions coupled with windy conditions that will have a culmination of creating critical fire weather conditions.” Northwest Montana, from Missoula up to the Canadian border should expect 25 to 30 mile per hour wind gusts that should die down around sunset. Southwest Montana should also expect gusty winds along with thunderstorms. Similar conditions are expected for Friday. A public meeting will be held at the Yaak Fire Station tonigh at 7 p.m. to discuss the Davis Fire and the others burning on the Kootenai National Forest. GRANTS PASS — It was a mixed bag on the Taylor Creek Fire on Wednesday. 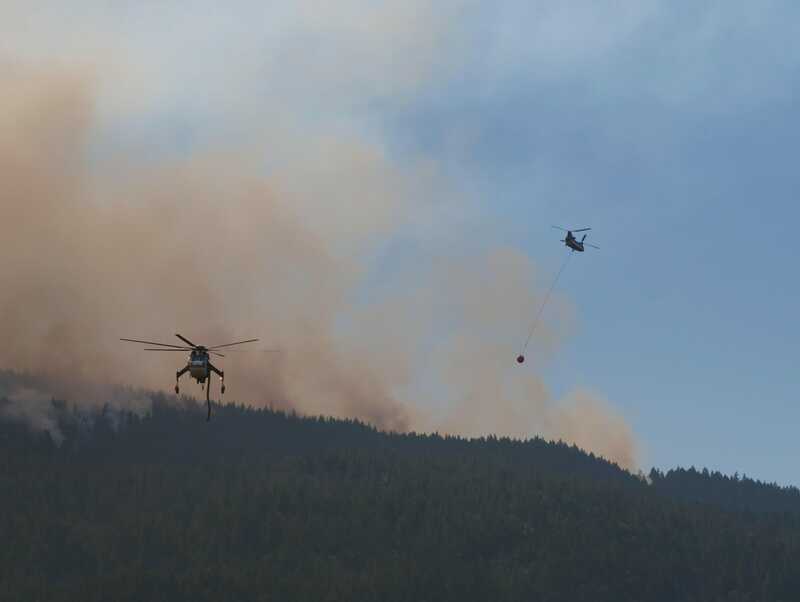 The fire grew to 31,600 acres after making a run to the west, while at the same time fire teams made good progress in containing the fire and protecting structures in the Rogue River and Galice area. No structures were burned at Indian Mary Park, a popular campground along the Rogue that had been evacuated earlier this week. And firefighters have been able to hold the blaze and not allow it to jump the river. The Taylor Creek Fire is 30 percent contained. It remains about three miles from the popular river village of Galice. “We were happy with how it went yesterday,” fire spokeswoman Lisa Rice said. Not wanting to over promise and then under deliver, Northern Energy Solutions Ltd., waited until Wednesday to reveal their plans to the public for a new pellet plant in Miramichi. Fenton Travis, the project’s manager, said the open house was held to give people an opportunity to see what has been planned over the last four years and let them ask questions about it. “It’s to let them know about the project we’re proposing to build in their community,” said Travis. Travis said Northern Energy Solutions Ltd., plans to operate a 275,000 ton wood pellet plant and then ship its finished product to Europe when it opens in 2021. “In Europe, they have environmental regulations that require them to reduce the CO2 that they’re using in their power generation,” he said.